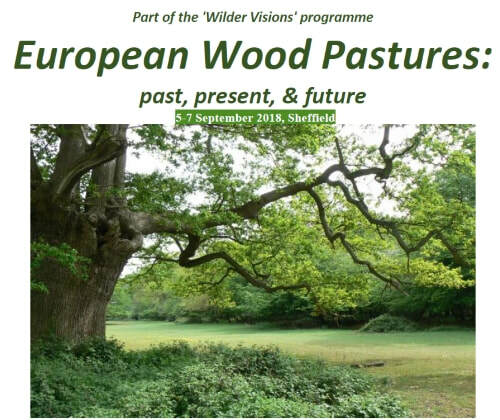 This conference, one of the Wilder Visions series, addresses key issues relating to wood pastures and wood meadows in Britain & Europe. Taking a view that knowledge of landscape history can improve understanding of the present countryside, we explore how this helps inform and influence decisions about ‘futurescapes’. With a nod to the Lawton idea of conservation needing to be bigger, bolder and more joined, we explore ideas of wood pastures past, present and future and how these might inform the ‘Wilder Visions – reconstructing nature for the 21st century’ development of case-study projects. 5) All associated aspects of ancient or veteran trees and their management. There will be a pre-conference field visit on 4th September to an internationally renowned site. The event will be co-chaired by Andrej Bobiec, Jeremy Dagley, Adrian Newton and Ian Rotherham. In addition, keynote speakers include Kinga Ollerer, Philip Warren, Ian Trueman, Ted Green, Nicklas Jansson, Della Hooke and Aljos Farnon. Invitation: We invite offers of spoken and poster presentations from across Britain and beyond from a broad range of professionals, landowners, agencies and researchers to reflect the many interests, activities and projects now taking place in these remarkable habitats. Offers of papers can be emailed to info@hallamec.plus.com by 31 March 2018; early submission recommended to avoid disappointment.